We are thrilled to host a blog from Rebecca Sorrell who is currently working in Uganda for Show Mercy International. 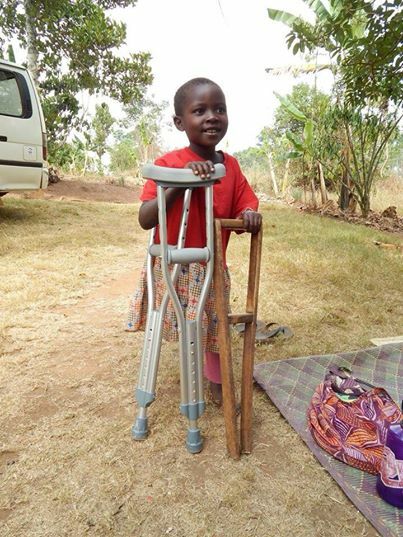 She contacted Crutches 4 Kids last month about Justine's need for a new pair of crutches and we sent a pair along with her sister-in-law Kelli who was traveling there soon thereafter. We are grateful to have the opportunity to be a part of helping Justine live a more fulfilling life. I met little Justine on a two week trip in August 2013 when I came to Uganda to work with Show Mercy International. Justine was a bubbly six year old who did her best to walk with her small wooden crutch. A few times, I witnessed her falling because of the uneven terrain their home was built on and the lack of traction from a crutch that had no rubber on the foot. When I returned to Uganda in January for an internship with Show Mercy, Justine had grown significantly and the wooden crutch was no longer beneficial for her to use. She was now forced to walk with a hunched back. As I continued to visit Justine's family each week I learned from her grandmother that when Justine was just a year old she had been hit by a car. It was only by Gods grace that she survived. Because of the severity of the damage, the doctors amputated her leg below the knee. When infection set, they were forced to take her whole leg. We measured Justine for a new crutch unsure where we would get one. Justin's crutches - before and after. Believing that someone would want to help Justine, I posted a photo of her and her story to my Facebook page. A friend of mine found Crutches 4 Kids and shared Justine's story with your organization. To my amazement, Crutches 4 Kids heard her story and sent a pair of the most beautiful crutches. They can expand as little Justine grows! She now has rubber for traction that keeps her from slipping and she no longer walks with a hunched back. It was truly celebration as we presented the crutches to Justine and her grandmother! Thank you Crutches 4 Kids for your generosity. A life in Uganda is forever changed because of your organization! Show Mercy thanks you for partnering with them to make a difference here in Uganda! May God continue to bless you and those who support you.